Our Wayne pediatric foot doctor and our West Milford pediatric foot doctor provide the very best in foot care for children. We treat patients of all ages, including children. Whether your child has an ingrown toenail or any other condition, you can rest assured that their feet are in the hands of an expert pediatric foot doctor. 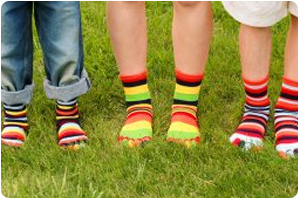 Your child’s feet are unique because they’re still growing, so any issues that arise with them should be addressed as soon as possible. Some of the most common foot issues for children involve the growth plates present in their feet. Kids’ feet usually stop growing when they’re about 13, so if your child complains of foot or ankle pain before then, give us a call at (973) 595-8900. We can help make sure your child’s feet are as healthy and happy as possible. Clubfoot is one of the most familiar foot conditions seen in both infants and children. Although Clubfoot has no cause, it is twice as likely to occur if one or both parents has had a similar diagnosis. Clubfoot can be identified in infants by a twist of the heels and toes inward while giving the appearance that the top of the foot is wrapped around to the bottom. At Wayne Foot & Ankle Center, we understand the severity of clubfoot and our goal is to correct your child’s foot structure and functionality. Our Wayne Foot & Ankle Center podiatrists will place a cast onto your child’s foot. The cast will gently and gradually shift the structure of your child’s foot into proper alignment. The process is then repeated to make sure that your child’s foot retains the results from treatment. The Serial Casting procedure is typically pain-free, and your podiatrists at Wayne Foot & Ankle make keeping your child as comfortable throughout his or her treatment top priority! Come and experience Wayne Foot & Ankle and you will see we offer the very best of podiatry care for children in and around Paterson, Oakland, Haledon, North Haledon, Pompton Plains, West Milford, Woodland Park, Totowa, Pompton Lakes, Kinnelon, Wayne and Hewitt, New Jersey (NJ).